Spelling. 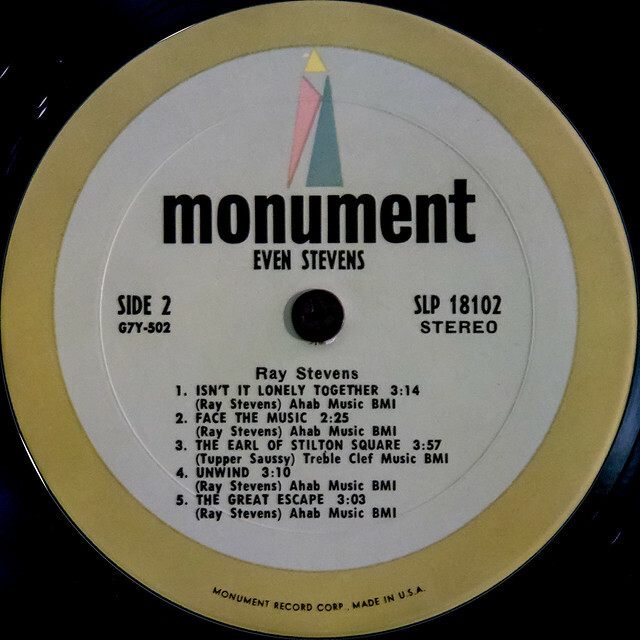 Are you looking for Jay Stevens or May Stevens? Ray Stevens: Harold Ray Ragsdale, known professionally as Ray Stevens, is an American country and pop singer-songwriter and comedian. albums: "#1 With a Bullet", "1,837 Seconds of Humor / This Is Ray Stevens", "12 Hits", "1,837 Seconds of Humor", "20 Comedy Hits", "20th Century Masters: The Millennium Collection: The Best of Ray Stevens", "A Brighter Day", "A Funny Thing Happened in Church Today", "Ahab the Arab", "All-Time Greatest Hits", "All-Time Hits", "At His Best", "Back 2 Back", "Be Your Own Best Friend", "Beside Myself", "Boogity Boogity", "Both Sides of Ray Stevens", "Box Set", "Classic Masters", "Classic Ray Stevens", "Collection", "Collector's Series", "Cornball", "Crackin Up", "Do You Wanna Dance? ", "Don't Laugh Now", "Ear Candy", "Even Stevens", "Everything Is Beautiful", "Everything Is Beautiful & Other Hits", "Everything Is Beautiful / Unreal!!! ", "Feel the Music", "Five More Steps / Tingle", "Funniest Characters", "Funny Man", "Get Serious! The ORIGINAL Movie Soundtrack", "Get the Best of Ray Stevens", "Gitarzan", "Golden Classics/Collector's Edition", "Great Gospel Songs", "Greatest Hits", "Greatest Hits, Volume 2", "Greatest Hits: The 50th Anniversary Collection", "Guitarzan", "Have a Little Talk with Myself"
"A Tribute to Chet Atkins"
nominated to Grammy Award for Best Male Pop Vocal Performance - "Gitarzan"
nominated to Grammy Award for Record of the Year - "Everything Is Beautiful"
nominated to Grammy Award for Song of the Year - "Everything Is Beautiful"
nominated to Grammy Award for Best Male Pop Vocal Performance - "Everything Is Beautiful"
Grammy Award for Best Male Pop Vocal Performance - "Everything Is Beautiful"
nominated to Country Music Association Award for Song of the Year - "The Streak"
nominated to Grammy Award for Best Instrumental Arrangement Accompanying Vocalist(s) - "Misty"
nominated to Juno Award for International Single of the Year - "The Streak"
Ray Stevens: Carl Ray Stevens, better known as Ray "The Crippler" Stevens or Ray "Blond Bomber" Stevens, was an American professional wrestler. Stevens was a wrestling superstar since the early years of the television era until he retired during the early 1990s. His performances and hard bumping style inspired generations of heel wrestlers who have attempted to emulate his ability to provide high quality and heat generating matches that continuously bring in huge crowds of fans. He was well known for using two different finishing moves in his many victories: the "Bombs Away" knee drop and the piledriver. Stevens wrestled as both a singles performer and in tag team matches with a variety of partners. In 2006, he was inducted into the Professional Wrestling Hall of Fame. filmography: played Wrestler #21 in "Paradise Alley"
Ray Stevens: Raymond Alexander Stevens, MP is an Australian politician who is the Leader of the House in the Legislative Assembly of Queensland. Ray Stevens a.k.a. Henri Vernes: Charles-Henri-Jean Dewisme, better known by his pen name Henri Vernes, is an author of action and science-fiction novels, of which has he published over 200 titles. He is most noted for the creation of the character Bob Morane, a hero whose adventures spanned fifty years and went from straight adventure and science-fiction to fantasy. Vernes also wrote the text of many comics albums and animated movies. Ray Stevens is a former English badminton player. A winner of numerous English national championships and international titles in both singles and doubles, his strengths were his power, tenacity, and concentration. Ray Stevens is a film editor. A proposed country-rock variety series for singer Ray Stevens that was to feature performances by guest artists. Host: Ray Stevens. Guests: Olivia NewtonJohn, Franklyn Ajaye, The Limelighters. Go to the wordplay of Ray Stevens for some fun with words!